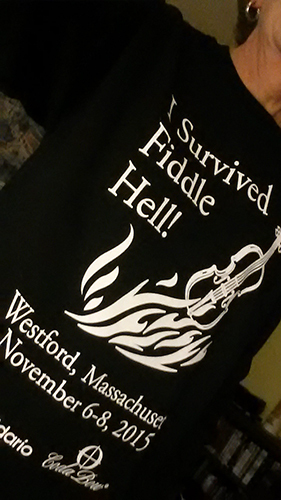 A fiddlers' convention, November 6-8, 2015, in Westford, Massachusetts. Fiddle Hell Massachusetts is a yearly gathering of fiddlers to meet, jam, learn, and have fun. It's both friendly and diverse, crossing all ages and including many traditional fiddle styles. Typically, there are about 1/3 beginners, 1/3 intermediates, and 1/3 advanced players, with many workshop and jam session choices at each level. Fiddle Hell 2015 will be held at the Westford Regency Inn, 219 Littleton Road, Westford, Massachusetts. There's lots of workshop and jamming space, loads of free parking, nice rooms if you wish to stay over (and a swimming pool! ), and good food both onsite and nearby. Sessions, workshops, the concert and dance, and late night jams will all be under one roof! More than 230 workshops and jams are scheduled. The cutoff for the special Fiddle Hell hotel room rate of $99/night is this Friday, Oct. 16. As for Fiddle Hell registration, fiddlers can just show up when they like during the weekend and register on site. There is no requirement to pre-register or prepay (although if you do pre-pay it saves you money for the weekend and will enter you into the CodaBow discount certificate drawing). This will be my third Fiddle Hell. I can tell you that it's a blast and I learned a lot. It would be so cool to meet up with other Fiddlerman.com members at Fiddle Hell. If anyone else is going to be there, please chime in here or PM me. For more info, see http://www.reinerfamilyband.co.....ction.html. I am so excited for you Diane! Can't wait to hear all about this 3rd event.....so exciting to see everyone grow as violinists over the years..
How exciting!! I would come in a heart beat, but ..... anyway, the song on the Reiner family band site Beaumont Rag - I have to learn it!! Wish you and other Fiddlerman members could be there, @Schaick . It's a great learning opportunity and it would be so cool to be able to jam together. Can't wait to hear more of Fiddlehell when you are home and rested up. I agree with Toni, I can't wait to hear how it went 🙂 It sounds like such a neat event! This was my third consecutive Fiddle Hell. The Westford Regency in Westford, Mass. is a very good venue for the event, with spacious workshop rooms, nice hotel rooms and good food. Westford is about 45 minutes from my home. The first year that I attended, it was held at the historic Colonial Inn in Concord, Mass., which had quaint New England ambiance and excellent food, but the workshop rooms were way too crowded. The chairs were so close together, it was a wonder that no one lost an eye from another fiddler's bow. I attended sessions on how to jam, how to learn by ear, and bowing patterns, as well as workshops on learning tunes in different styles, including Cape Breton, Old Time and bluegrass. Over the course of the weekend, there are workshops on every genre and technique, at every level. The workshops are taught by professional fiddlers, many of whom are well known. The approach for most workshops is to teach tunes and techniques by ear, though some instructors hand out sheet music for the tunes they teach, for future reference. On Saturday night there was a concert featuring several of the instructors. After that I attended a late night bluegrass jam in which I played mandolin. All in all, I learned a lot and enjoyed interacting and playing with other fiddlers at or near my level, and observing fiddlers much better than me. I highly recommend this event to anyone in New England or who is inclined to travel here. Hope to see some Fiddlerman members at Fiddle Hell 2016! Looking for any videos that may be out there. Watching FH Facebook page. Did you notice any violas or sessions for viola there? I really hope to make it next year as it is my weekend off. Can I stick with my viola, or should I brush up on the violin? A lot of photos and comments have been posted there, too, which provide a good feel for the event. I'm pretty sure that I saw a viola or two. I know for sure that I saw a few cellos. In fact, a young woman playing a cello joined in the bluegrass jam on Saturday night and played a mean break on one song. There were also people playing mandolin (considered honorary fiddles 🙂 ), guitar, claw hammer banjo, bass, tin whistle and keyboard.